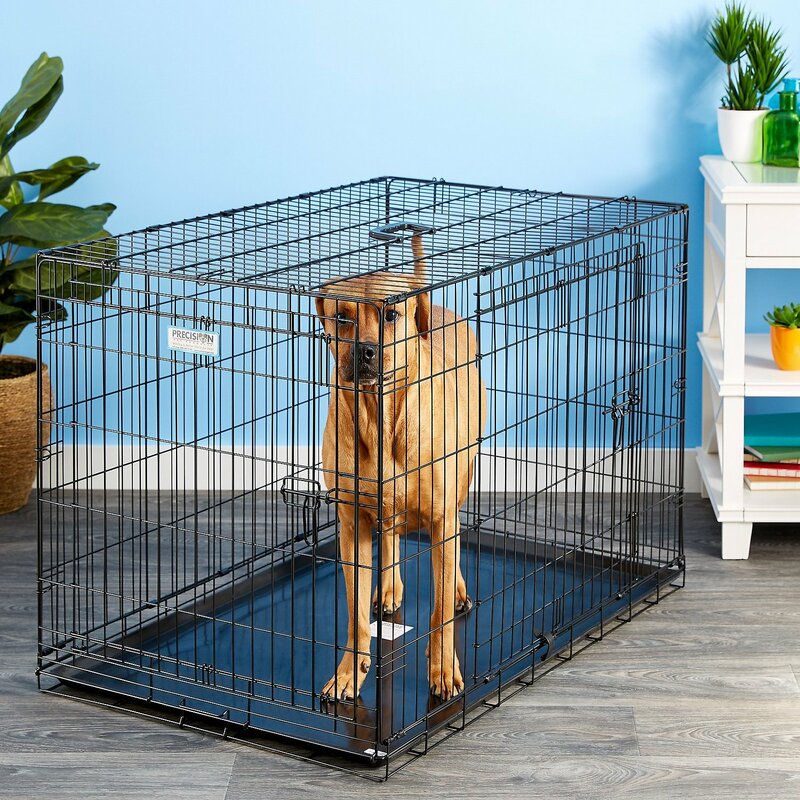 The divider panel allows you to adjust the size of the crate as your puppy grows, providing safety, security, ventilation and visibility for your pet. Found the exact crate at our local pet store and they were asking literally twice the price for ONE, $79! We didn’t hesitate on buying two from Chewy. The 3000 (medium) fits each of our frenchies perfectly with plenty of room to grow. Plastic tray bottom makes for easy clean up under your crate pad. Great quality. Chewy, you’re the best! I bought two. They’re easy to set up. Love the double doors! This size is great for my 10 month old Doberman Pinscher’s. They can stand up in them, and they have plenty of room to lay down and stretch out their legs. Our dog Joey loves his new cage. 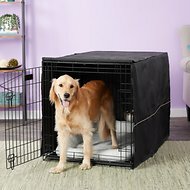 Hits big enough for him and he has extra room and that is what I really wanted and needed!!!!!!! I love this crate. The handle on top, the doors, how sturdy this is. My dog is a Jack Russell and she is about 16 pounds. She fits in this crate just fine. Now, if she was going to be in there for any length of time I would probably get her the next size up. I bought this for her so that she could escape from our Mastiff sometimes. I won't be locking her in so this works just fine for our needs. My Great Dane puppy was able to escape this crate when she was still under 50 lbs. Many dogs may not try and get out like my dog so this may work for you. 1 Star due to the the wires/frame/doors bending easily and rusting everywhere. My 6 month old puppy managed to break the welded lock off making it useless. Very disappointed. Bought in August and it's now December. Not worth the money we paid for it. I love that the doors have the five hooks to secure the door and it was great for my akita when he was a puppy. He has now figured out all he has to do is headbut the door and the bottom hook will pop right out. I am afraid he is going to get hurt trying to get out of the bottom of the door and he bends it up at night. I put a pad lock in the corner now to keep him from pushing the door open.